About six weeks ago, I was delighted to spot a blackbird spending some time wiping the slime off a slug. I didn't actually see the slug being devoured, but I'm assuming that's what happened next. The other day, I was less impressed to see a blackbird in my cherry tree. Last year, that tree only had a few cherries on it and the birds didn't bother with it. This year, it's well laden, and I've been looking forward to the fruit ripening. 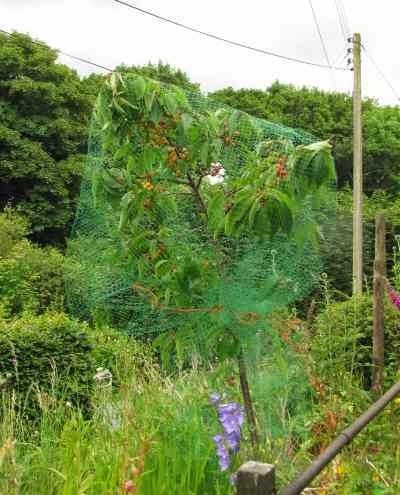 I draped a net over the tree, but the clever blackbird still found a way in. I was so impressed by his boldness and intelligence that I was almost prepared to let him have the cherries. Almost. I have tied string around the net in the hope that this will make it too difficult for the blackbird to get in. He watched me do it. Effects of different soil nutrients? This wasn't an experiment, so I'm just guessing what's going on here. I don't usually bother too much about what I sow my seeds into. In theory, seeds don't mind much where they germinate, as they have their own little store of food to get them started. It's only after they've got going that the soil nutrients make a difference, or so I've heard. 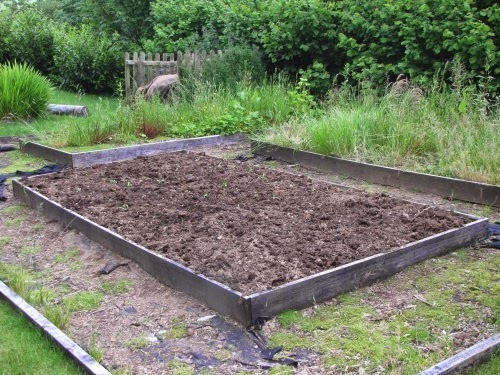 If you prick the seedlings out into new homes as soon as possible, the seed tray compost/soil shouldn't matter much. Of course, that's a big If . Since I don't pay much attention to what I put in my seed trays, I can't be sure what I've got here, but I do know that for some of the trays I used some garden compost from the year-before-last heap, which by now has a fine texture and was conveniently available. These two trays of basil were planted at the same time, using seeds from the same packet, and kept side by side in the greenhouse, so the number of variables that could account for the difference is fairly small. I'm guessing that the tray on the left got old soil, which might have been used to germinate other seeds already, whereas the tray on the right is presumably full of garden compost. Of course I knew that soil nutrients are important, but seeing the contrast in these seedlings really brought it home to me. I shall make more effort now to ensure that my plants are well fed. If you're the kind of person who's prone to saying, Eew, too much information! then look away now. No, I mean it. This may look innocuous to start with, but by the time you get to the end of the post, you won't be enjoying it. Still here? Well don't say I didn't warn you. 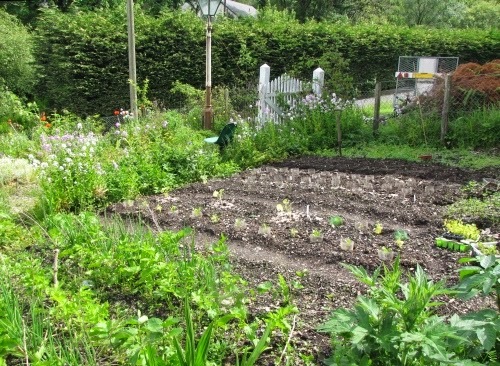 To grow crops, I need to feed the soil, and I have various sources of food for it. I've mentioned before that I was given a load of horse manure earlier this year, which is great. Another source of fertilizer is wood ash from the wood burning stove. This is quite strongly alkaline, so I use it in place of lime, with bonus nutrients, particularly potassium. I gather seaweed and feed it to my asparagus, though I'm not sure it's doing much good, and of course, I also have garden compost. 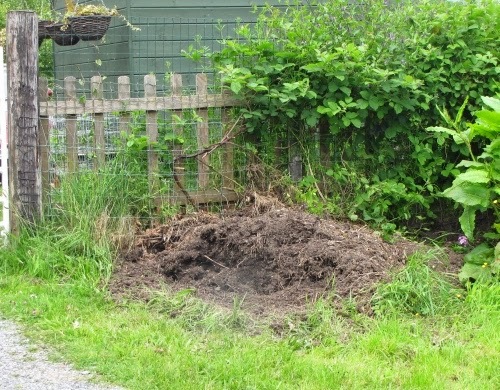 There's a lot written about how to make compost properly, but as far as I can tell, most of it seems to be how to make compost quickly. I'm not fussy about mine, apart from trying to avoid thick layers of one type of thing, like crass clippings or autumn leaves (those mostly go in a separate heap). I put pretty much everything on there. What hasn't rotted down in a year or so goes on the next heap. 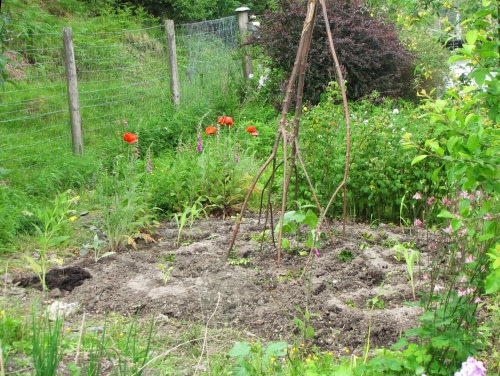 Last year's heap yielded somewhat upwards of 100 gallons of compost, one ants' next and three pounds of new potatoes. Comfrey sprawling all over the potatoes. It went all over the path, too, until I bent the stems back. A friend gave me a useful tip about comfrey tea: It's not necessary to put it in water and leave it to make a foul-smelling brew. If you just pack the leaves into a container with a weight on them, they'll produce a more concentrated tea that doesn't smell nearly as bad. Five gallons is unnecessarily large for camping, and very heavy when full. ... and cut a lid into the top of it. 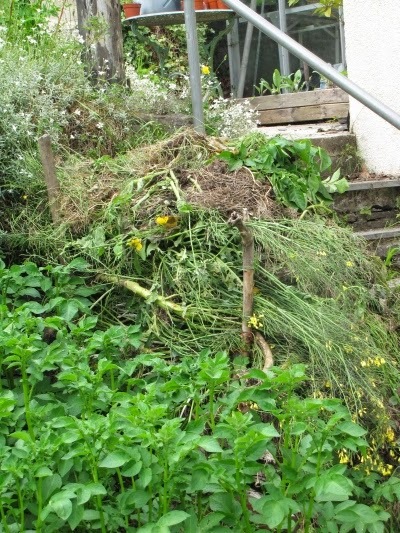 I pack the leaves into this - if there's space I include nettles as well as comfrey - and weight it down with a stone. I say leaves - I can't actually be bothered to strip them off the stalks, so I have a lot of very bulky stalks as well. If I didn't have the stalks, I could fit more nettles in. After a while, I can draw off a dark liquid that needs diluting about 1:20 before feeding to plants. I had horsetail so I made a tea from it, then forgot what it was supposed to be for. I think it might be a spray for blight. The unlabelled bottles on the left are urine. Yes, that's right... mine. It doesn't smell very nice, but if I can put up with that small unpleasantness, I have an excellent, well balanced fertilizer. The limiting factor on how much can be used is the salt content, but as I have a fairly low-salt diet, I'm not too worried about that. It's completely free, and I'd otherwise use drinking water to flush it away. It's a no-brainer, really. OK, here's the post that I meant to write a couple of weeks ago. Since the solar panels project is huge and daunting, I broke it down into sections: Making the panels themselves, mounting the panels in a suitable location, plumbing, and making an electronic controller. The last of these is the one that Dad finds most interesting, so conversations with him about solar panels tend to end up on that topic fairly quickly. For me, that's the least worrying (and probably the most fun) aspect of the project; I need help with the other bits. Having reduced, Mounting the panels to something less scary, my next most daunting part was plumbing. This was daunting because I'd never done plumbing before. After dithering about and failing to get started for about two years, I called Dad and asked him to come and help. He spent a week here last spring and was hugely helpful. 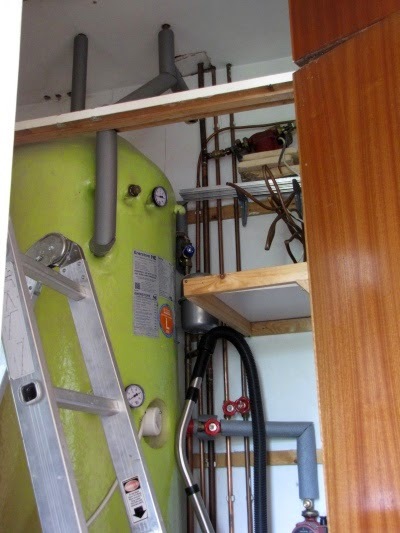 He put a lot of pipework in place, which was great, but since I didn't do it myself, I was just as much a novice at the practical side as I had been at the start of the week. However, going through the design and planning stage with him did teach me a lot, mainly about what's actually available in terms of different types of connectors and suchlike. Our initial design had a pump and valve (very important: With no valve, the loop is permanently open, allowing hot water from the tank to flow out to the higher solar panels whenever they're cooler, e.g. 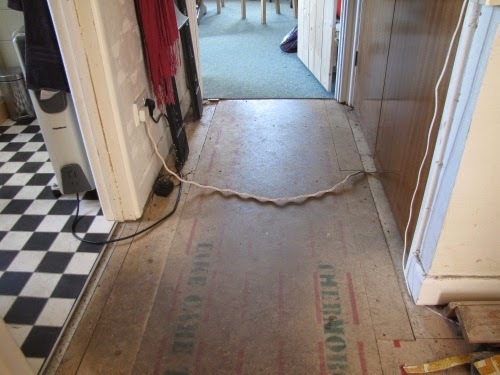 at night) in the cupboard with the thermal store, then pipes running from here out of the cupboard, over the kitchen door, through the wall into the conservatory, along one of the conservatory roof joists, and out onto the hillside. There, we'd have the solar panels and a header/expansion tank. This last item is necessary to allow the water to expand as it heats; a completely sealed system would probably explode and I don't fancy dealing with the more high-tech alternative, a pressure vessel. I'm never keen on spending money, so we salvaged as many parts for this as we could from things I already had. When I took the old central heating system out, I was careful to coil the microbore (10mm) pipes without kinking them if I could, so they could be reused. There was quite a lot of larger pipework, too, so we had plenty of pipes to play with. I found a spare header tank in the loft. There was a dead, dehydrated bat in it. I had an old washing machine that died of rust in the drum... or somewhere... it leaked, anyway. We salvaged both pump and valve from that (helpful having a dad who's taken many a washing machine apart in his time). Whilst I ended up with a much better understanding of plumbing and quite a lot of pipework in place, there were two main outcomes from that experiment: 1) A washing machine pump is not powerful enough for solar panels, and 2) The position on the bank where we'd put the header tank was not, in fact, the highest point in the system. This gave me two clear tasks to do next. 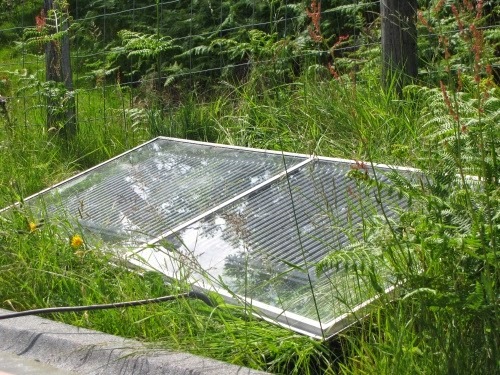 However, once Dad had gone home I then caught up with various other things that I hadn't been doing while he was staying... then got distracted... and so it ended up being almost a year later that I got back to the solar panels project. In the meantime, I had managed to buy a suitably powered pump. Being generally tight-fisted, I'd balked at buying an actual central heating pump and gone for a much cheaper aquarium pump instead. This may have been false economy. As soon as it arrived I saw that I'd made a mistake. The two nozzles shown in the photo were not an inlet and an outlet nozzle, but alternatives for the outlet. The inlet was covered by a grille. Evidently this was a submersible pump. Undaunted, I removed the grille and found a plastic ring that looked like something I might fix a pipe to. ... which enabled it to fit snugly into the pump. Looks promising, don't you think? This time I sealed it with glue and when I filled the pipe with water, my connection proved to be water tight. Unfortunately, the rest of the pump did not. Apparently, Water tight is not a requirement of submersible pumps. Maybe an actual central heating pump would be necessary after all. We did have one - it was in the old boiler. Ian was very doubtful about its likely performance, though. He said it was making terrible noises just before the boiler stopped working altogether. Still, given the cost of new pumps, I decided to try this one next. It wasn't easy to get out - I think the last step in manufacturing that boiler was to rivet panels to the outside, so I had to cut a pipe to get at some of the nuts. ... but the adapter proved surprisingly difficult to get hold of. Of course, it happened to be a Saturday afternoon when I was doing this, so trade suppliers weren't open, but I searched many websites. Having drawn a blank online, I looked again at that nut and noticed that as well as 18mm it also said Flowflex . I looked them up and their website didn't have any 18mm fittings either, but I thought they jolly well ought to have what I needed, so I sent them an email. After that, I couldn't do any more for the rest of the weekend. Come Monday morning, I tried calling a local plumbing trade supplier, who expressed bemusement at my request, No... they're usually 15mm or 22mm. Yes, I know that. Usually isn't very relevant to the nut I have in front of me. I then checked my email and found a reply from Flowflex: Yes, we still manufacture 18mm fittings, but the problem is that we can not sell to the end user, but please contact Dan at First 4 Fittings, Daniel.jones 'at' first4fittings.co.uk I share this with you, only slightly edited to avoid Dan getting inundated with spam, because if you happen to need this information (and it's possible that the wonder of Google will have brought you here in search of precisely this), you will be very glad of it. An email to Dan elicited a quote for what I needed within about ten minutes. It wasn't even expensive! A few days later I had my coupler, and a few other bits and pieces that I'd ordered at the same time, and I was ready to fit my pump. The only trouble was, I'd soldered the pipework in place to suit the aquarium pump. I skipped over that bit earlier but yes, I did soldering, and it didn't leak! Anyway, the pipe for the inlet side was not quite parallel with the wall, and also a bit low for where I wanted the new pump. I cut it back to make more space, but still needed a pipe running at an interesting angle into the pump. I spent some time assembling a wooden mount for the pump, including a wedge to fit between it and the wall. Did you notice that the 18mm pipes have bends in them? I decided to make use of one of these to get an upwards slope, as well as angling the pipe slightly towards the wall. The final arrangement should fit, but calculating and measuring felt like too much of a challenge. I'd have to offer it up, tighten everything up, then screw the mount to the wall wherever it ended up. This presented a problem. If I tightened the connections fully, I wouldn't be able to drill holes in the wall because the mount would be in the way. If I didn't tighten them up, I wouldn't know where to drill the holes. Also, that pump is really heavy and it needs to go high up in the back of a cupboard. This was my workspace when plumbing. I had bruised ribs for days from leaning across that bar. That shelf isn't actually doing anything any more. I just haven't got round to taking it down yet. I'd already got the header tank connected up (this involved cutting a hole in the ceiling and moving rockwool. Ugh) so at this stage I was almost ready to test the whole system for leaks. I just needed to connect up the radiator outside, which I did with much PTFE tape. I expected it to leak like a sieve, which wouldn't matter for current purposes, but surprisingly it didn't. Filling the header tank involved water spraying everywhere when I tried to connect the hose to a bathroom tap, then much going up and down of stairs and the ladder once I'd reverted to the outside tap connection. Filling the system involved raiding a spare light fitting for an electrical connecter block, and an extension lead. Without power, the important valve stays closed, so a section of the loop contains a large air bubble. I was delighted to find that after tightening the connections a little more, there were only two small leaks. One I already knew about, in the plumbing that Dad did, and one on the outlet of the header tank, where I'd twisted it a little while tightening an adjacent connection. At the same time, I felt a little flat. Yes, I'd completed a major section of the work (well, almost. I still had those leaks to fix), but I had nothing to show for it. I've now fixed the leak in the loft (but not yet the one in Dad's bit) and you'll know if you've read my previous post that I'm now feeling a bit more enthusiastic about it. The next step is to make a box so I can insulate the radiator. I might even be brave enough to plumb it in properly. This is all backwards, because I've done some plumbing that I haven't yet told you about, but, fascinating though pumps and pipework may be(! ), this is far more exciting. Just to bring you up to speed, the situation this morning was household pipework in place, with hardly any leaks and a working pump. 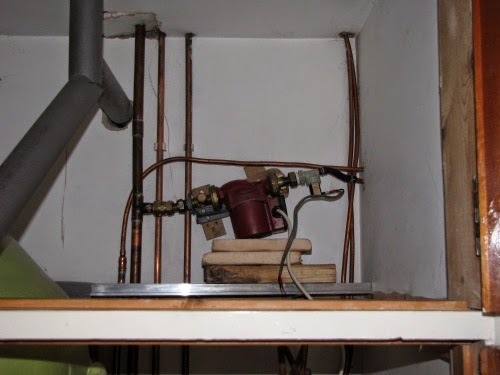 One black-painted radiator is outside, more or less in position, connected to the pipework with temporary connections (for the purpose of testing the household plumbing) that proved surprisingly leak-free. This morning, sitting on the terrace eating my breakfast in the blazing sunshine, I thought, This is ridiculous. I have a complete, if rather basic, solar panel connected up to my household plumbing. Why am I not using it yet? I upgraded the panel slightly by bringing the largest caravan window up and laying it over the radiator. Solar panel. Basic, but slightly less basic than a radiator on its own. A little later in the day I upgraded slightly further by stuffing a blanket along the top edge, blocking the gaps where the radiator fins waft hot air up and away from the radiator. Before that, though, I filled the header tank in the loft, which involves running a hosepipe from the outside tap downstairs, up through the loft hatch and into the tank, then going back downstairs to turn the tap on, hoping that the top end of the pipe stays put, then when it's full, removing the hosepipe so it doesn't siphon all the water back out again. Switching on the pump - initially just to fill the panel - requires an extension lead. This is not a long-term solution. Once I had the system filled, I waited a bit then went to check the temperature of the panel, by which I mean, stuck my hand under the glass to feel whether the radiator was hot yet. It heated up quite quickly - half an hour to hand hot , at which point I turned the pump on. Actual hot water flowed through the pipes and into the coil in the tank! I got terribly excited about this. I can't say the impact on the temperature of the tank was very dramatic - maybe one degree Celcius increase each time I pumped the hot water round, but as Ian said, we need to bear in mind how long it takes for the wood-burner to heat the water in that tank, and that's a great deal hotter than hand hot ! This experiment also highlighted the importance of an automatic controller. I'm going up the stairs to check the temperature of the panel maybe four times an hour, and when it's hot enough, running the pump until the pipes are cool again, which takes about ten minutes, and much monitoring. 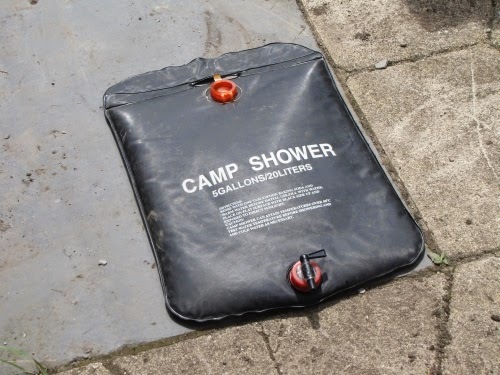 We've never used the drizzly little shower attachment that came with this, but it does heat a few litres of water in a couple of hours. After feeling that I've got behind for some time (and I really have), I've been very busy in the garden over the last week. My poor tomatoes - the ones that friends kindly gave me after most of mine got eaten by slugs - have been straining to get out of their small pots for far too long. The trouble is, planting out tomatoes isn't so much out as a complete transformation of the greenhouse. The shelf gets dismantled and the tomatoes go into compost bags on the floor, with plenty of space for vertical growth. Of course, at the time the tomatoes needed their space, the shelf was full of things that needed to go somewhere else. 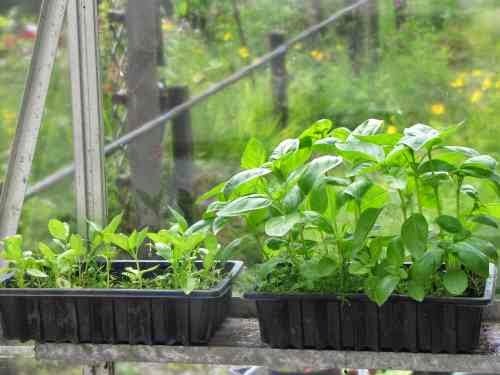 Or in some case, things that could do with a bit more time in the greenhouse, but were getting in the way of the tomatoes. By early June I decided that, tender or not, everything could go outside. We did have a frost on 12th June the first year we lived here, but that notwithstanding, I think it should be pretty safe by now. Of course this meant doing the work of planting them out. I had in mind to use one of the beds I'd originally earmarked for beans as a Three sisters bed. 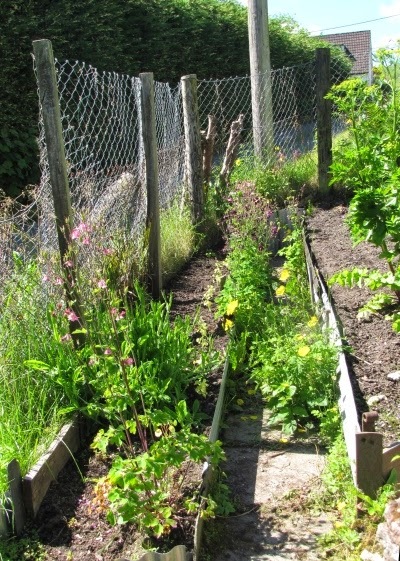 This is a companion planting group learnt from Native Americans that consists of sweetcorn, climbing beans and squash. A friend had given me some sweetcorn seeds and a few of them had germinated. After slug damage, I had six left, which is not very many but perhaps enough to give it a go. I also have Hokkaido squash, which require a huge amount of space, apparently. Gill had given me a piece of tree to use as a bean frame, so I added that in (she wanted to use it in her garden, but it wouldn't fit) and Barbara gave me a tromboncino climbing squash, so that could go in the middle. This plan is all very well, but first I had to remove the broccoli that I'd left to set seed. The seeds weren't ripe enough to harvest, so I just discarded the lot. I looked at the tough, woody stems of the broccoli and thought, Those'll need shredding if I want them to compost. I looked at the compost heap and thought, I need more wood for side slats before I put anything else on there, or it'll fall off all over the potatoes. I put these two thoughts together and used the broccoli stems as side slats on the compost heap. With the broccoli out of the way, there were some difficult decisions to make about the flowers around the edge of the bed. Some of them had encroached quite a long way into the space I needed for vegetables. Compromises were made. The three sisters. It's hard to believe these plants are going to fill this bed. I'm not at all sure I have sufficient density of sweetcorn for pollination. 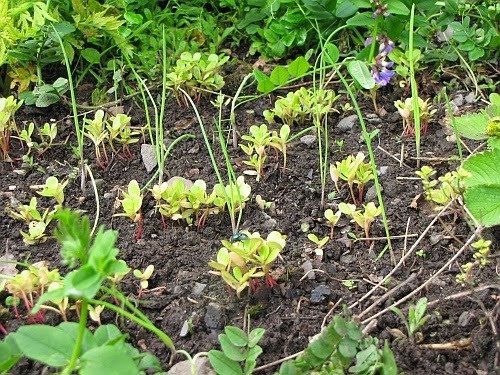 I've been steadily working my way along the other bed, that is, neither potatoes not legumes. The parsnips and shallots are looking great, though I'm not sure what's happened to the garlic. I think most of it didn't survive being rolled on. I've added leeks, which are small enough to be almost invisible, pak choi, cabbages, courgettes, fennel and celery. ...which are not 100% effective. 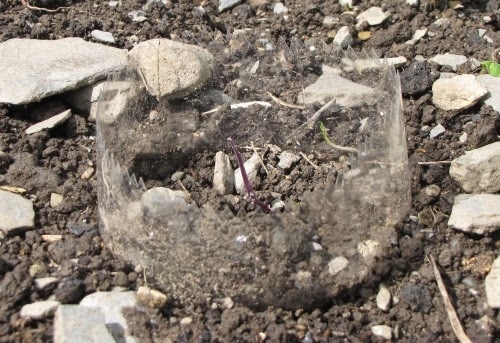 One ex-cabbage. It's the only one that's been eaten so far. I also turned my attention to the bed above the patio. I'd originally envisaged this as a herb bed, but that didn't quite work out. The oregano and thyme are doing well, and the sage is just about hanging in there, but parsley and chives got slaughtered. I'm having another go, this time with salad vegetables. How I think these will survive when herbs didn't, I don't know. "Welsh" preserves the original meaning of the Old English word "welisc", or Old German "welsche", meaning "foreign" (compare wal- in "walnut", of the same etymological origin). The species originated in Asia, possibly Siberia or China. Never mind. 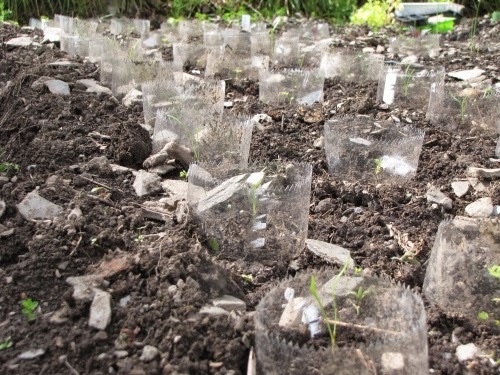 They're perennial onions, anyway, which I think would be a very useful thing to have established in the garden. The other plant is purslane, which I believe is a weed in much of America, but not common here. It has the highest Omega 3 content of any vegetable, and having tasted some of the young leaves, they do have a slight oiliness about them. 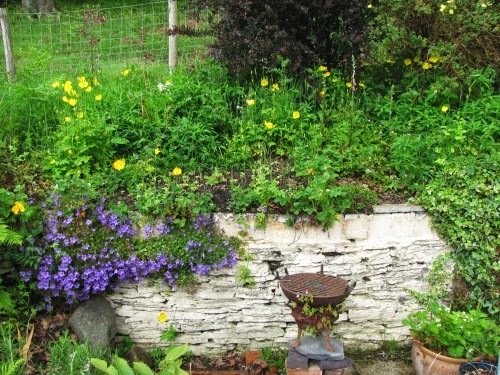 Finally, as if I didn't have enough to do with my own garden, a neighbour offered me the use of his garden this year, as he's away a lot and not likely to do much with it himself. This seemed like a good opportunity to try something I've been thinking about for a while, especially when someone on a forum offered seeds for sale: Sugar beet. Though this is a major agricultural crop in the UK, it's not much grown in gardens, so it's very difficult to get seeds in small quantities. The ones my forum-friend was offering came from America. I've heard that early sowings can be prone to bolt, so I planted a few early in the hope that they'll do just that, and I'll be able to save seeds for next year. So far, they're mostly getting chewed, in preference to the weeds all around them. They're hanging in there, though, so there's hope yet. Since sugar beet's an important crop, there have been many trials to address the question I was asking. Unfortunately for me, the results were mostly reported in yield per acre. This is useful if space is the limiting factor and seed is cheap enough to be effectively unlimited. 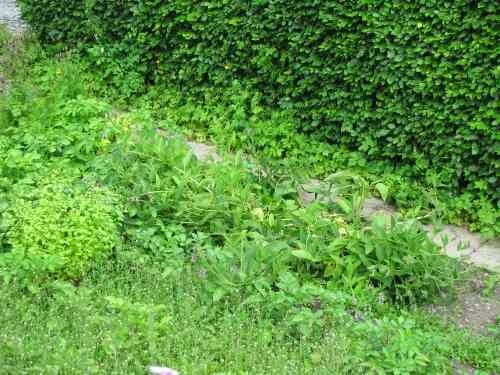 My situation is the opposite; I have a very limited supply of seeds and as much space as I can be bothered to dig. Also, farmers tend to have very wide gaps between the rows, and closer gaps between plants, which I found hard to translate to my garden plot. 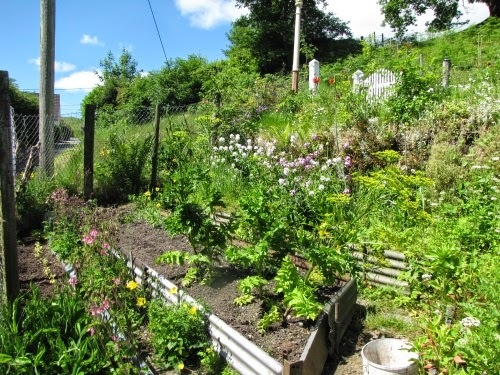 In the end, after much study, I planted them slightly more closely than I would have done otherwise; one foot between rows and about nine inches between plants within each row. 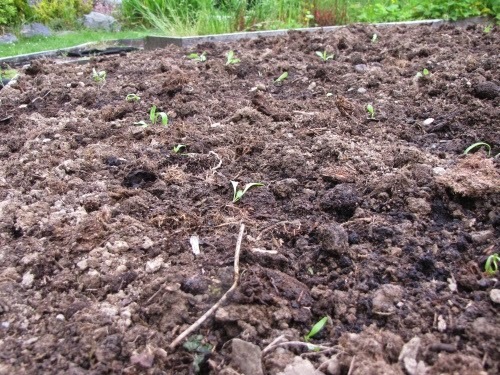 I've also sown some green beans and the rest of the peas, along with nasturtiums. You can hardly see them now, but once those nasturtiums get going, they should be spectacular. The tall plants on the right are parsnips, flowering, and in the bed on the other side of them are a few leeks, which I've also left to flower. I need to clear that bed for more beans, and maybe another squash or two, but the sweet rocket is so pretty!